Pizzle is a chewy longer lasting totally digestible hard brown stick of muscle, suitable for dogs of all sizes, perfect for pups and small dogs. A flavoursome longer lasting chew as recommended by Ham & Dotty the rescue greyhounds they prefer these to a kangaroo tendon. Beef Pizzle is an excellent chew that is suitable for any size dog but absolutely perfect for puppies and small dogs. A Super healthy treat that is highly palatable, easily digestible and contains absolutely no additives, chemicals or preservatives. Chewing on this hard brown stick of muscle is great for helping maintain healthy gums, strong teeth and does a great job of cleaning your dog’s teeth. They do not stink and they are way healthier than a pig’s ear which can be around 58% fat. Compare me to a kangaroo tendon YES, honestly your pup will love you even more as these are truley delicious. Loyalty Pet Treats Nutrieseal™ process guarantees your dog a pure natural way to clean their teeth and massage the gums and keeping them strong & healthy. Our beef is Queensland bred and is free range grass fed. At Loyalty Pet Treats we choose NOT to Google a generalised nutritional analysis on any of our products. This analysis is done specifically on LPT products at NATA registered laboratories. Our analysis validates the effectiveness of our Nutrieseal™ process. This analysis is not applicable to any other form of drying of these products. 0.9% fat wow that is great, love your treats. Loyalty Pet Treats you are the best I read your fat content 0.9%. I can now happily feed your pizzles with confidence to my dog with a sensitive stomach. My dog has fallen in love with Loyalty Pet Treats. They are the best treats I have found. Zippy goes crazy when I bring out the bag. She knows where they are (in the pantry) & sits at the door waiting begging me for more. Thank you Loyalty Pet Treats so happy I found you. We both love LPT pizzle! I love that I can trust LPT’s sourcing and methods, pricing is reasonable and Lucy gets her chewy. Lucy loves this best of all other pizzles, just the right size for chewing for her Princess jaws. Thank you, LPT! So happy the I can purchase straight from a LOCAL FAMILY OWNED business. The service is fantastic, the treats are THE best, the value is phenomenal. Never had a dog reject any LPT treats that we offer. My little mate loves to share is wealth of goodies, from Roo Tendon, Roo Chews, Beef Chews, Pizzles, they all go down will on play date. Thanks guys for taking such pride in what you do for our animals. love your treats, my dogs love them all! Love supporting an Australian family business. Our tripe is tripe that is unbleached & untreated but rinsed with hot water (scalded) to deal with the nasty bacteria our authorities say can make you & your pet sick. Nothing but beef, only one ingredient Australian grass fed beef! The ultimate training treat for your pet. Suitable for dogs & cats. Made from Queensland premium beef nothing added just pure beef. Easy to break into small pieces for training or great for a special reward. 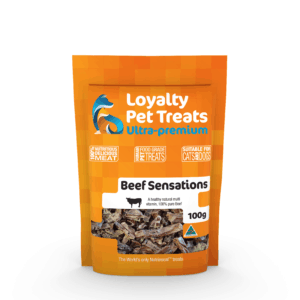 With our Beef & Lamb Meal Topper you can achieve optimal health and enhance the nutrition and palatability of your dog or cats meal. Their taste buds appreciate delicious changes on their palate. Thin and crispy superior quality, Australian grass fed Pure Beef Liver, you’re feeding the highest quality liver treat in the world. Smell the difference see the difference with Loyalty Pet Treats. Tripe Meal Topper is the closest to feeding a raw diet. It is totally digestible, 100% pure and natural. 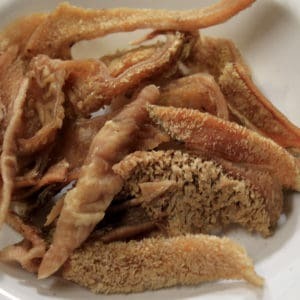 Tripe Meal Topper is tripe that is unbleached & untreated but has been lightly rinsed. The perfect gift when you cannot decide what to get. Send a Gift voucher online straight to someone’s inbox!